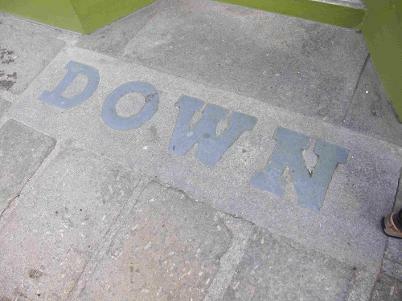 In front of No 6, West Street, is the name 'Down' set into the pavement. This comes from a family who were grocers and provision dealers in the town for over 100 years. A John Down married a Margaret Fursman Leaman in Ashburton 21 August 1796, after banns. John is a sojourner (temporary resident) in the parish. This is probably the couple who have nine children baptized in Ashburton, the first of them in 1797. They are the only Down family shown in Family Search in Ashburton at the time. John Down, son of John and Margaret, is baptized in July 1806. Another John Down, son of John, had been buried in 1804. One child, Margaretta, has the middle name Leaman. 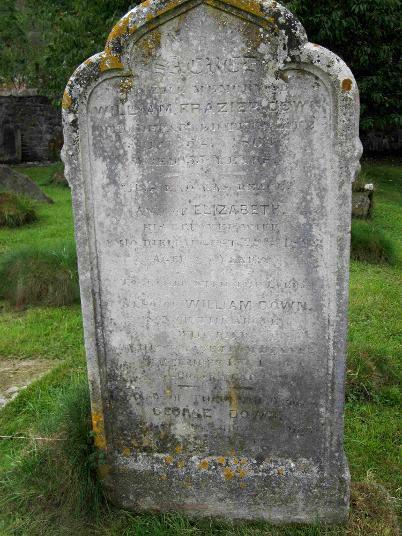 John Down may have died in November 1833, aged 65. William Frazer Down was born in Ashburton on the first of May and baptised on 2 July 1809, one of the nine children of John Down and his wife Margaret. He married Elizabeth Ford on February 3rd 1833 - Richard Ford and Mary Ford were witnesses. William was trading circa 1834 - see the newspaper item below from 1864. 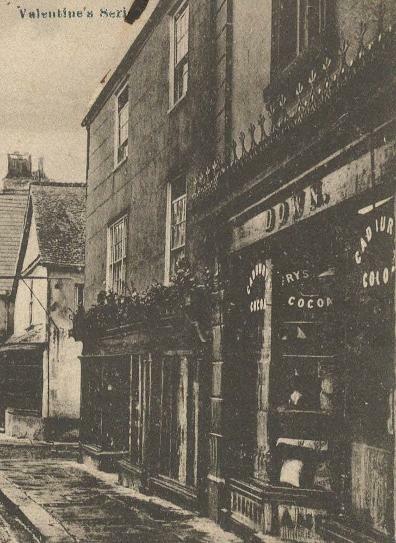 In 1844 William Fraizier Down was a grocer in East Street, and was still there in the early 1850s. The 1851 census shows him next to the Duke's Head, i.e. No 4 East Street. He and Elizabeth have five children; Elizabeth was born in Ashburton. But by 1861 they were living, and probably trading, from West Street - possibly at No 6. His wife Elizabeth and son John are with him, as, on census night at least, is his brother-in-law William Seacombe, also a grocer. William Down appeared incensed in 1864 - an 'evil disposed person' had begun a rumour that he was bankrupt. He offered a reward of £500 to anybody who could prove that this had ever been the case. He thanked his friends and customers, and assured them that he would continue to offer high quality products at 'very low profits'. He writes of trading for 30 years - this would take the beginning of his business back to about 1834. In July a large number of Ashburtonians petitioned the House of Lords in favour of the Teign Valley Railway Bill. J. Down and W. F. Down were amongst the signatories. William died later that year (William Fraser Down in http://www.freebmd.org.uk/) and his son John carried on the business. John Down married Mary Ann Cowell in the Newton Abbot registration district in 1862. The GRO website confirms that the mother's maiden name of Sarah Maria Down, born 1862, is Cowell. In the 1870s section of the Virtual museum is a document from J Down, Tea Dealer, Grocer and Provision Factor, West Street, Ashburton. The 1871 census shows John Down, a 35 year old widower, living in West Street: he is a grocer and tea dealer. With him in the household are his daughters Sarah Maria Down, 8, Emma Ford Down, 7, and Annie Bertha C. Down; and his son William Frazier Down. His widowed mother Elizabeth and cousin Isabella Ford are also with him on census night. 'My grandmother was Emma Down, her sister was Sally Down. Emma Down moved to Leadville, Colorado when she was a very young woman.to care for an uncle who was ill. She never returned to Ashburton, but married a Thomas Davis. They produced my father, Franklin Davis in 1896. Thomas Davis died two years later. Emma died in Santa Ana, California in l939*. She owned and managed a small hotel on Coronado Island, California. She had remarried a man with the last name of Cross, who died many years before Emma's death. My father, Franklin Davis, whose mother was Emma Down, spent some time visiting family in Ashburton during World II. When the war started he joined the Canadian Army. Being a Texan, they put him in the Cavalry. and shipped him off to England for more training. Though he'd never been on a horse, he jumped on, stayed on, and all were impressed. He was nicknamed Tex. Many thanks to Ethelwynne Wilson for the account above. * Actually a bit later than this - see census below. The 1920 census shows a household in Coronado Township, San Diego, California, headed by Oscar R Cross. His wife is Emma F Cross, aged 56 and born in England. Her immigration year was 1890. Oscar is the manager of real estate, and Emma the manager of a hotel. Emma Ford Cross is a widow on the 1940 census, a 76 year old manager of her own hotel. 'Sally moved to the United States sometime later than Emma, first to Cleveland, where she married a J C Harding. She lived in San Diego, California with their son Almy who became a dentist in San Diego. My great aunt Sally Down's husband J. C. Harding was born in Ashburton also. (That info came from his bio}. He had first moved to Canada, then to Cleveland where he worked for the Cleveland Medical Library most, or all, of his professional life. He died on 8th December 1952. Sally moved to San Diego with their son Almy because he had some allergies and the climate was better for him. Sally also had a huge Persian cat who ruled the house, sat in the most comfortable chair, glared and hissed as you passed. It seems likely that J C Harding was John Charles Harding, the son of John and Ann. At the time of the 1861 census John Snr. was a watchmaker in East Street, with his son John C being 3 months old. John Snr. 's sister Thirza is also with the family. John Charles was baptised in November 1863, with his father being described as a silversmith. John C and Sarah M Harding are both librarians at a medical library on the 1910 US census for Cleveland Ward 12, Cuyahoga, Ohio. Their son, 8 year old J C Almy, is with them in the household. The 1920 census states that John Harding immigrated to the US in 1881, and his wife Sarah immigrated in 1891. Their son Allmy J is with them in the household. On the 1940 US census 79 year old John C Harding and his wife Sarah M Harding, 78, are living in El Cajon, San Diego, California. Both were born in England. The obituary states that John Charles was born on January 3rd, 1861, which fits with the census information above. It also says that his wife, Sarah, was the first librarian of the Cleveland Medical Library in 1898, with her husband becoming assistant in 1900. He succeeded his wife as Librarian in 1918. In 1908 Mrs S M Harding is listed as librarian of the Cleveland Medical Library Association. The library held 14,000 volumes. In 1872 the Newton Abbot petty sessions granted John Down a license to sell petroleum. In 1881 Elizabeth is living in her son John's house (labelled 'shop' in the census) in West Street. Assisting John, who is also widowed, is his daughter Sarah Maria, his son William F*., and a cousin, Isabella Ford. A younger daughter, Annie B C Down, is a scholar at this time. October 11 1881. J Down of Ashburton married Mary Tarr of Cheltenham (formerly of Goodstone, Ashburton) at Dungarvon, Ireland. 19 November 1889, St Lawrence Chapel. At the Court Leet and the Court Baron of the Right Hon Lord Clinton, Lord of the Manor, John Down was elected Portreeve. He had been Bailiff the previous year. In March 1890 he presided over a committee meeting of the Ashburton Improvement Society, which adopted a scheme for a building company in the town. Many of the 500 shares of £5 each were taken up at the meeting, and John Down himself was a shareholder by the time of the first meeting. See The Ashburton Building Company under Banks and Businesses. In 1891 John Down is shown as a grocer and provision dealer in West St. Although on his own for a second time he now has a son George H J, aged 8. George Henry J Down was born in the Newton Abbot district December Quarter 1882, with mother's maiden name Tarr. John Down's son William Frazier Down, born in 1865, is by this time no longer working in his father's business in Ashburton. In the June quarter of 1888 he married Elizabeth Mantle Smith* in the Edmonton district. 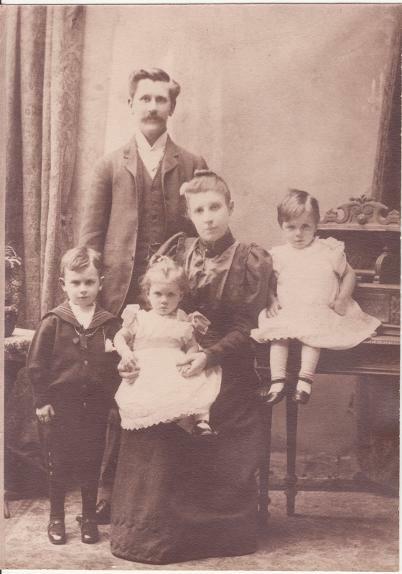 Left: William Frazier Down, Elizabeth and their children Elizabeth Alice (Lil), Dorothy (Doll) and William F Jnr (born 1890). Later children were John and Ronald. They emigrated circa 1910/1911, moving first to Canada, and then to the United States. In 1902 there was a wedding at the Congregational Church – Mr William Beer of Wadebridge married Miss Bertha Down*, youngest daughter of Mr John Down. The Rev Dr Naish officiated. The bride wore a white silk dress, which was embroidered in lovers' knots of pearls and ribbons. Her veil and wreath of were of orange blossom, and she carried shower bouquet. The bridesmaids wore white cashmere skirts, tucked and strapped with pale green silk; the bodices were trimmed with pale green silk and white chiffon. They carried bouquets of pink roses and lilies of the valley. An announcement in the Western Times on November 18th said that the wife of Mr William Beer had given birth to a daughter. Although not named in the newspaper report, this daughter was Ethelwynne - the only child to survive from the marriage. 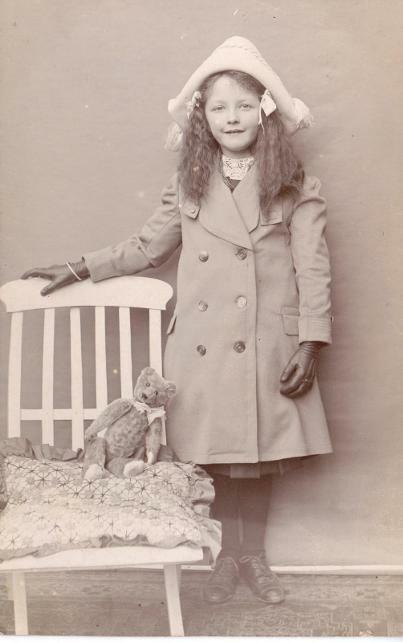 The reverse of the postcard reads: Ethelwynne Beer, age 9 years, 1912. Wishing you all a Happy Xmas and New Year. The card was produced by Mrs A Hannaford, Photographer, 3 Vealenia Terrace, Ashburton. 1908 John Syms and John David Bowden were charged with breaking into John Down's warehouse at Craig's Corner, where he stored potatoes. Louis White, apprentice to Mr Down, gave evidence. The 1911 census shows John Down still working as a grocer and provision dealer at 75, but he is in partnership with his son-in-law, William Beer. William Beer's wife, Bertha, is assisting in the business - Ethelwynne is aged 7. In 1914 Down and Beer, West St., Ashburton, feature in Kelly's Directory, although John Down died in 1913. His obituary in the Western Times described him as 'the oldest tradesman in the town', and went on to say that he had been Portreeve from 1899-90 (it should have been 1889-90). He had been treasurer of the Ashburton Lodge of Oddfellows, and was a Deacon of the Congregational Church. The principal mourners at the funeral were his daughters Mrs W Beer and Miss E M Down, and his brother Mr G Down. 1935 Down and Beer, Grocers, feature in Kelly's directory. The telephone number is 34. In 1940 (William) Beer, living at Trevone, advertised a good salary for a working manager for a good-class grocery and provisions business. Candidates had to have the highest references and be over military age. Three years later, on July 15th, 1943, William died. A Grocer for 'many years', he lived at 'Trevone' after retirement. * He was a choirmaster at Ashburton Methodist Church, and superintendent of the Sunday School; he was also a manager of the local school. Aged 66 when he died, he was buried in Ashburton churchyard. He left a widow and daughter. *He had been there since at least 1933 – various advertisements feature in newspapers from that date, usually to do with renting out property, where respondents have to contact Beer at Trevone. Trevone is in Eastern Road. In 1949 The Western Times reported the funeral of Mrs. Eleanor Beer, widow of Mr E K Beer, who had been in business at London House. Mrs William Beer, sister-in-law, and E Beer, niece, were amongst the mourners, as was Raymond Beer, the son of the deceased. The above report seems to confirm that E K Beer and William were brothers: probably William Beer baptised 1877 and Edgar Knight Beer baptised 1884, both at the Camelford Wesleyan Circuit, the sons of Joseph and Elizabeth Beer. A third child, Ethel, was also baptised in 1881. On the 1911 census William is down as being born in Delabole, Cornwall.